Rory McIlroy is staring at an opportunity to claim a season opening win at the Sentry Tournament of Champions in Hawaii. Eleven times since 2008 McIlroy has begun a new year on the European Tour and on each occasion he’s gone so close to success including on four occasions being runner-up in the Abu Dhabi HSBC Championship and once losing a playoff at the BMW SA Open. Now in his very first event of a new year on the PGA Tour and McIlroy again finds himself in familiar territory after posting a second straight five-under par 68 to move to 14-under par and remain in second place heading to Hawaiian final round. American Gary Woodland is clearly benefitting from a decision to commence working with putting expert, Phil Kenyon, continues to lead the ‘winners-only’ event finding the ‘side door’ for birdie at the 18th hole and this after brilliantly eagling the par-5 15th hole in an eventual round of 68 for a three-shot lead at 17-under par. Woodland, 34 qualified for the event in capturing the Phoenix Open and his third PGA Tour success while the scholars of the pro game will recall the Kansas-born Woodland led the opening two rounds of last year’s PGA Championship before eventually securing a share of 6th place. And Woodland revealed after his round the emotion he fought in learning late on Friday his beloved grandmother had passed away. “My grandmother died last night so that was hard to deal with but then I’m pleased to play as well as I did,” said the very affable American. McIlroy headed into round three sharing second place with two others at nine-under par and also three strokes adrift of Woodland and while Woodland remains three clear, on the plus side for McIlroy is that he’s come from behind in seven of his 14 PGA Tour wins, including the past three, to capture victory. Though on the flipside of that statistic is the fact McIlroy was in last group on seven occasions in 2018 (six on the PGA Tour and also at the Omega Dubai Desert Classic) and failed to close-out any including playing the final round of the Tour Championship in Atlanta alongside Tiger Woods. McIlroy’s third round was bogey-free but while he was seven-under over the back nine for his opening 36-holes he was just one-under over the same nine holes on day three and that was thanks to a birdie at the 14th and with the Ulsterman failing to hole an eight-footer for birdie at the par-5 18th. Those who did birdie 18 included Woodland along with Aussie Marc Leishman (68) and in third place at 13-under par and also the American duo of Bryson DeChambeau (70) and sharing fourth place at 12-under par with American Xander Schauffele (68) who also ended with a last hole birdie. 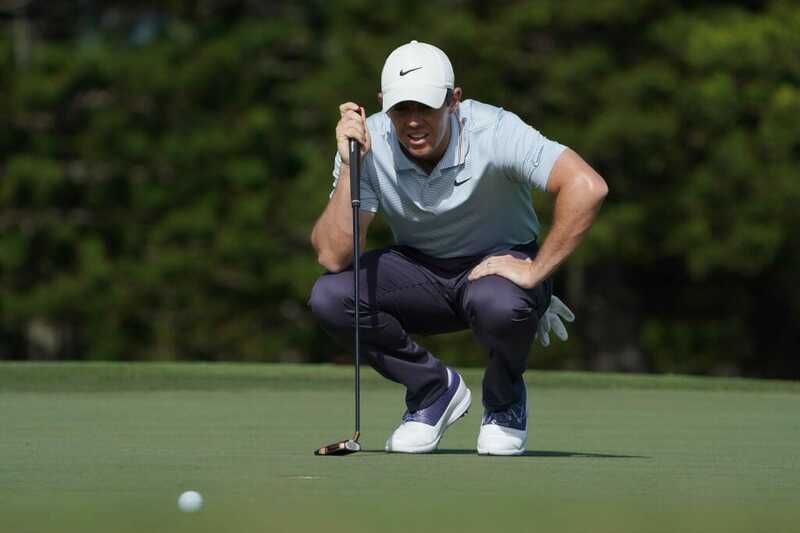 “I did not get the best out of my round as I was five-under through 14 holes and you’ve got 15, 16, 17 and 18 coming in and you feel like you should birdie,” said McIlroy. “I got away with a good par on 16 and then where the hole location is on 18 is very tricky. It’s tough as you want to go at the pin and you know there is that bail out right but that’s a tough up-and-down. And McIlroy played down any suggestions his appearance for a first time in his career in Hawaii was more about than just making-up the numbers. “I don’t enter tournaments just to show up,” he said. “I enter them to try to come and win. I worked pretty hard over the last few weeks trying to get ready for this event and get ready for the start of the year. So, yeah, it’s nice that everything’s going to plan. “Again, another final group is great. Especially coming off the back of not being able to play as well as I would have liked in final groups last year.